We have some really exciting news for you, we’re releasing new labels! They’ll be rolling out soon and we’re so excited to share them with you. Not only are we completely changing the look and feel of our line, we’re totally leveling up when it comes to sustainability. Yes, we’re an all natural skin care company and take great care to produce quality products and give you great information about the potentially harmful effects of chemicals in your skin care but we really wanted to go a step further and extend that same type of care into our packaging. Though we’re not concerned about the chemicals from typical labels leaching into your body just from touching them (at least we haven’t read any studies confirming those potential dangers), we are concerned about our carbon footprint. We think it’s vitally important to take care of the Earth every way possible, and that includes the processing and packaging of our products. Since we have been working on these labels for quite some time, we want to share a bit of information with you about the process of typical labeling and our process of finding the perfect label for our brand. There are a lot of different types of labels out there and we could (and did) spend days looking for the perfect solution. It took a long time because at every juncture we ran into issues with sustainability and the biodegradability of the products we were offered. It turns out that the labeling industry is similar to the skin care industry in that there are a lot of chemicals used in the process and those chemicals aren’t discussed because it’s all about how pretty the labels turn out. We think it’s possible to have a beautiful label and take care of our home. 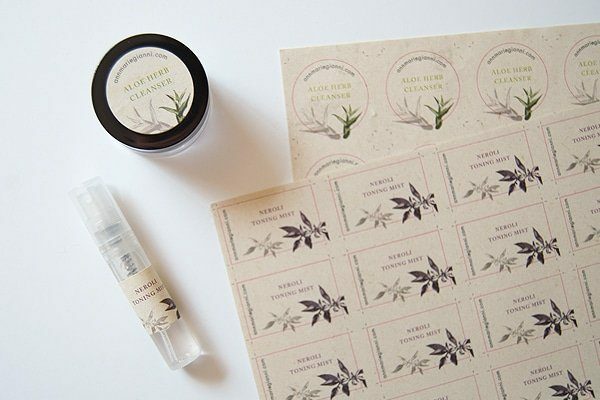 Choosing a label material is a first step—what do you want your design printed on? There are plenty of options but the most common ones available are synthetically made or paper. Typically, synthetic labels are created for the purpose of being able to stay on the product through tough conditions—like weather or bright sunlight exposure over time. They’re made out of materials like polypropylene and vinyl, materials full of pollutants that don’t break down easily and when they do break down they leach those pollutants into the environment. We don’t need that type of label and we don’t want to use any type of synthetics. Paper labels are the most common option that companies use. While some companies offer eco-friendly recycled paper, newly made paper is more common and then those paper labels are covered with a synthetic laminate like varnish or an aqueous solution to protect them from the elements. Even if a company chooses not to use a laminate on top, most labels lose their biodegradability when the adhesive is applied. I’m just going to go ahead and say this, the glue to secure a label to a bottle can have some gnarly chemicals components in them. Because we use the Miron Glass we aren’t concerned about those chemicals leaching into our products, but this project is all about the carbon footprint for us. Why would we go to all the trouble to keep our line and our packaging as clean as possible and then use an adhesive that’s creation puts petrochemicals into the environment and that makes our bottle not recyclable? We wouldn’t. Polyvinyl compounds are very common, lease offensive of which is polyvinyl acetate which is used in wood glues and on envelopes—this reminded us of the Seinfeld episode where George’s fiance died from licking wedding invitations, but that’s neither here nor there. Acrylic-based polymers are a plastic made using a catalyst of amines with a free radical mechanism. The process of making these polymers releases free radicals into the air and they are made so that they can withstand weathering without breaking down, which means they’re sitting in landfills for a very, very long time. The options are all but exhaustible and we were feeling stuck (no pun intended) without a great adhesive to help us with our sustainability goals. If you try to google the ingredients in ink, you’ll end up with a history lesson—which is a fascinating rabbit hole to follow but the history is so long and the process of ink creation has become so complex that you won’t end up with a pretty list of ingredients. Like with the rest of the label components, there are options for organic or inorganic compounds depending on the desired texture, color, sheen, and pigment. There are different bases of ink ranging from water to a chemical solvent to UV protectant. Most companies make their ink choices based on their needs—fast drying, doesn’t fade in sunlight, easy to clean, etc—but these faster drying inks that are able to be printed on any sort of material often turn into a plastic which isn’t biodegradable or the process of creating/drying the ink involves petrochemicals that are released into the environment. We found ourselves, again, rolling our eyes at the pretty colors vs safe for the Earth conundrum. We really don’t like the feeling that we go through all the rigor to bring you such beautiful products but the labels are made from materials that aren’t safe for our environment but when we decided to go the miles to sustainable, biodegradable labels, we were a bit overwhelmed to learn all of this (and believe me when I say that there is so much more.) We know that we’re leaders in the skin care industry for completely chemical-free products, could we do the same thing with the labels? Yes. We can. We did the research and found Elevate Packaging under their trademark of Pure Labels. Like us, they do everything they can to bring the best, most sustainable products to market. They helped us so much and now we can say that our labels are 100% compostable! That’s right, 100% compostable. Even the smallest particle of a non-biodegradable material can contaminate compost and we are so thrilled to work with a company that wants to be as clean and environmentally friendly as we do! Our new labels are paper made from 100% sugarcane plant fiber waste. That means our labels are tree-free and made from a material that would have otherwise been disposed of! They aren’t chlorine bleached and they break down easily in compost. The ink is a UV protectant type that is free of the most dangerous heavy metals (lead, mercury, cadmium, or chromium) and it doesn’t have any chemical constituents that are listed as unsafe air pollutants by US Federal regulations or drinking water contaminants by California regulations. The Pure Label adhesive is made from a raw, vegan source that is sustainable and completely natural. It’s a proprietary blend of sticky stuff that is water-based, compostable and recyclable. Although we couldn’t get every detail about the ingredients of the adhesive, our COO and head of the label project, Rachel, spoke at length with the Elevate Packaging company and feels confident that their master chemists are on their game when it comes to making our clean adhesive dreams come true. Lastly, and most importantly for you to know, we’re really big on reusing our bottles so we decided not to go with a coating on top of the labels. This way, they could be washed off really easily when your product is gone! The only thing you need to be careful with is making sure you’re not soaking or scrubbing your bottles until you’re ready to reuse them. What do you think of our new labels? New labels are beautiful but I really love the multi-colored ones! Would you be interested in getting the empty bottles back? I do not mind shipping them to you if you are going to use them. Thanks for your question and your interest in reusing bottles! I’m impressed, Annmarie team! Congratulations on taking it to the next level. And thank you for your thoughtfulness towards our planet. Namaste.